It’s been quite a week for space debris. Our favorite space debris movie, Gravity, is making headlines once again as it elbows through the Hollywood awards season. The International Space Station is once again maneuvering to avoid getting clobbered by passing detritus. But there have also been some positive developments in debris management sharing the spotlight in the media this week. 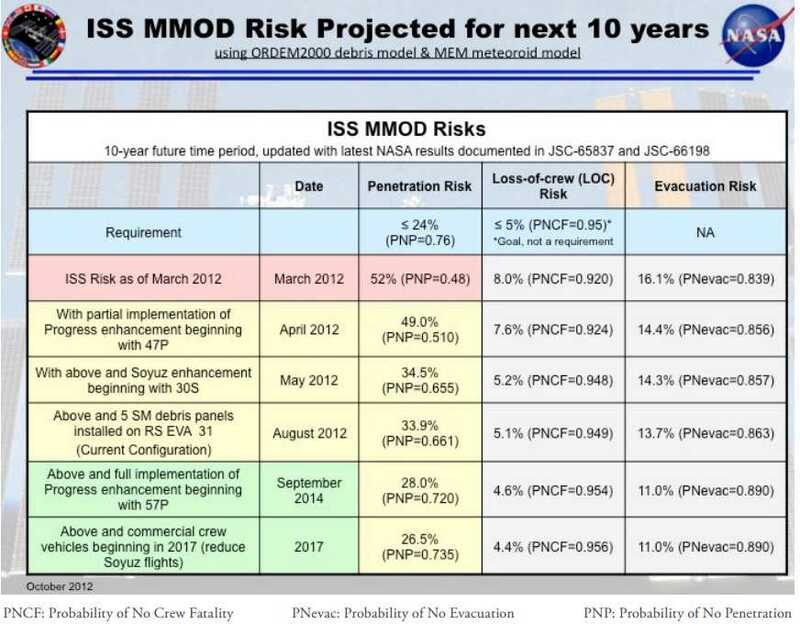 Projected ISS MMOD risk as reported in the 2012 ASAP Assessment Report (Credits: NASA/ASAP). +Let’s start with the January 15 release of the NASA’s Aerospace Safety Advisory Panel 2013 Report. The report is a good read all through (more on this later in the week), but the panel’s comments on the management of micrometeroids and orbital debris (MMOD) with respect to the International Space Station were a rare ray of sunshine – or actually spot of green – in a table of yellow and red coded assessments. While last year’s assessment read “Significant progress has been made in Space Station Micrometeoroid and Orbital Debris (MMOD) tolerance and in planning for ISS deorbit. NASA should complete the planning as quickly as possible,” this year’s report deals the following hearty slap on the back: “NASA is taking all feasible steps to mitigate MMOD risk.” That is really saying something considering that prior assessments had painted a grim picture, as illustrated by the projected risk chart to the right. Of course, the panel then goes on to note that “The ongoing work on end-of-life and deorbit planning is comprehensive and thorough. It should be finished as soon as possible.” That assessment has been dealt a bit of a monkey wrench with the announcement of another proposed ISS extension, so we can look for more on that subject in the 2014 report. +Lest we become too complacent regarding our collective debris management capabilities, the first 2014 issue of Orbital Debris Quarterly News also came out this week. It observed the 7th anniversary of the destruction of the Fengyun 1C satellite, still the worst debris-generating event in spaceflight history, by noting that due to lower than anticipated solar activity, 90% of the debris from this event is still orbiting. 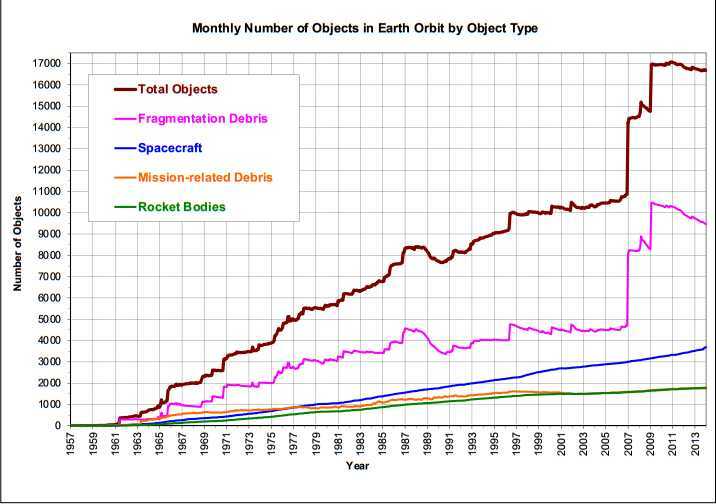 The newsletter also introduced an updated, more comprehensive Orbital Debris Engineering Model. Details for obtaining the new model can be found here. +On January 10, US Strategic Command (USSTRATCOM), which holds a majority of US and worldwide space debris surveillance capability, announced a data sharing agreement with the Canadian Department of National Defence. According to the announcement, “the agreement will permit an advanced exchange of space situational awareness data.” USSTRATCOM already has active data sharing agreements with Japan, Australia, and Italy. +Simultaneously, science media has exploded with reports on a new approach to round up space debris that has emerged from Japanese Space Agency JAXA. Japan is an island nation and if its denizens know anything, it’s how to catch fish. JAXA considered its alternatives and in 2011 reached out to fishing equipment company Nitto Seimo to design a net appropriate for fishing space debris out of orbit. The result will be tested in February when a 300 m long net made of three metallic fibers that generate a magnetic field is deployed for testing on orbit. Once debris particles are captured, the satellite and its attached net reenter to burn up in the atmosphere. While the net maybe ideal for smaller debris objects, JAXA is also working on deorbiting entire spacecraft. In February, JAXA will also deploy an experimental electrodynamic tether. The tether is used to create drag that slows a defunct spacecraft to gradually reduce its altitude until it reenters the atmosphere. +In what may be a first (if you know of other such cases, tell us in the comments!) an endowed chair position was created at the University of Buffalo to be called the CUBRC Professor in Space Situational Awareness. The position was created through the donation of research firm CUBRC to honor researcher John L. Crassidis for his work in tracking space debris. He is currently collaborating with the US Air Force on a debris-tracking satellite. +Just to demonstrate that this space debris thing really is a growing problem, the International Space Station was required to delay an orbital maneuver it had planned for January 16 to at least January 18 as it waits for a bit of debris to pass it by. The maneuver is required as a drag-compensating boost and must be complete before the February 6 arrival of a Progress resupply vessel. With this much activity in the opening weeks of January, 2014 might just end up being the year we figure out how to manage the ever-growing challenge of space debris.